We love to entertain, especially with a theme! Each year, we throw a kid & adult friendly Halloween party! 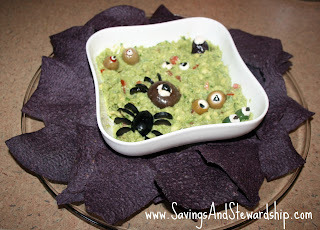 This year, I thought it would be fun to dress up our favorite Guacamole Recipe (inspired by Alton Brown) to make a unique Spookamole dish! We love Avocados all year & use them in so many dishes (as an ingredient or just to eat on their own)! You can find Avocados from Mexico (the most popular Haas variety) year-round in your local store. To check for ripeness, they should give slightly when pressed on with your thumb and be a very dark green color. In a bowl with a flat bottom (or pie plate), mash the avocados & lime juice with a potato masher or fork to desired consistency. Mix in remaining ingredients until well incorporated. Transfer to serving dish & serve with chips or veggies. To dress up this recipe “spooky-style”, I picked up fun ingredients from the Mediterranean Bar at my local grocery store. I ended up with a few black olives (pitted), a few green olives stuffed with various items, a few balsamic vinaigrette cipollini onions, mini mozzarella balls, etc. To create my spider, I cut a black olive in half horizontally and then thinly sliced 8 “legs” out of one half. Piecing together the remaining half & “legs”, I fixed them into the guacamole to make a spider! So easy! I then used the remaining ingredients to make various eye-balls and monster fingers & scattered them around the dip. Finally, I paired my guacamole dip with blue corn chips, just for fun! I’m also entering this recipe into the Avocados from Mexico Recipe Contest! You can enter your own recipe for a chance to win $1,000 or other prizes! Be sure to get your submission in by 11:59pm TONIGHT (9/30)! 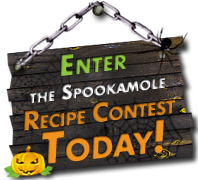 I wrote this review while participating in a Spookamole blog tour by Mom Central Consulting on behalf of Avocados from Mexico and received avocado items to facilitate my review and a promotional item to thank me for taking the time to participate. All opinions & recipe submissions are my own.